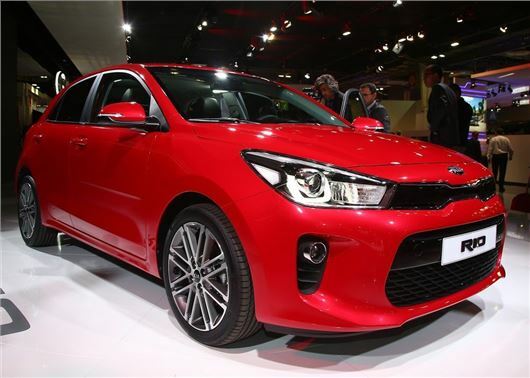 Kia has unwrapped the fourth-generation Rio at the Paris Motor Show 2016. The new Rio should reach the UK in early 2017, with new engines, more tech and a £10,000 starting price. 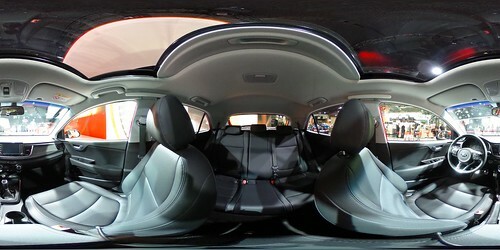 The new Kia Rio gets more interior space and a larger 325-litre boot over its predecessor. It also sits on a longer wheelbase which should provide more legroom in the front and back. Under the bonnet the Rio gets Kia's latest 1.0-litre three-cylinder petrol, with 100PS or 120PS. Both should emit less than 100g/km of CO2. Kia will also offer the familiar 1.25-litre and 1.4-litre petrols and a 1.4 CRDi diesel, although there are no details about fuel economy for these or the new three-cylinder engine. The exterior looks similar to the old Rio, although thinner headlights and U-shaped LED light signatures provide a fresher appearance. The rear section of the Rio is now more upright, with LED taillights and redesigned bumper layout. Inside, the cabin gets a neat, clutter-free layout with a smart dashboard that's dominated by a large touchscreen system. Kia is billing this Rio as the "most technologically-advanced it has ever produced", with automatic city braking and a pedestrian recognition camera that will - in theory - prevent the car from hitting someone if they step out in front of it at low speeds. In-car connectivity should also be better, with the Rio getting both Android Auto and Apple CarPlay integration.